Everybody wants power. Kids want power. Adults want power. Some seek it through getting lots of money. Some people seek power through political office. Many presidents, senators, congressman are where they are simply because they have a lust for power. There are power struggles in our businesses, schools, and homes. We all want to be in control, and we all want power. We’ve got Power Ade, Power Bars and Power Rangers. Of course, power is not a bad thing. Power is not evil. It is like food or money or possessions. These are not bad things, but if they become our obsession, they become idols. If we want too much of these things, they become perverted from what they were designed for. Power is not a bad thing, as long as it comes from the right source, and is used correctly. 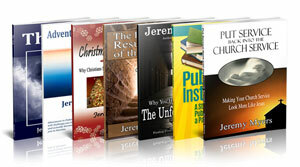 In fact, what the world longs for—ultimate and all-consuming power—guess what?—Christians already have. It is interesting, is it not, that most of the things the world longs for—never-ending life, overwhelming joy, unconditional love, satisfaction, power—all of these things are already found…and only found…in the Christian life. Today we are just looking at the power that we have as Christians. We are looking at Ephesians 1:19-23. Turn there please. So far in Ephesians we have looked at the possessions, the riches that we have in Christ. Paul told us that the two primary purposes of these riches were that we would use them to give glory to God and gain knowledge of God. And in Ephesians 1:18-19, Paul wanted us to gain knowledge of three specific things. First was our hope, second was our riches, and third was our power. And this power that we have in Christ which Paul wants us to experience is so great, that he spends the next five verses talking about it. Even though we have already looked at the first part of Ephesians 1:19, I included it because this is where Paul introduced the power that he now wants to talk about. We already saw, as this verse states, that this power is only for us who believe. Bill Gates does not have this power with all of his money. Presidents, Senators and congressmen do not have this kind of power not have this power with all of their political achievements. Harry Potter does not have this power with all of his magical skills. 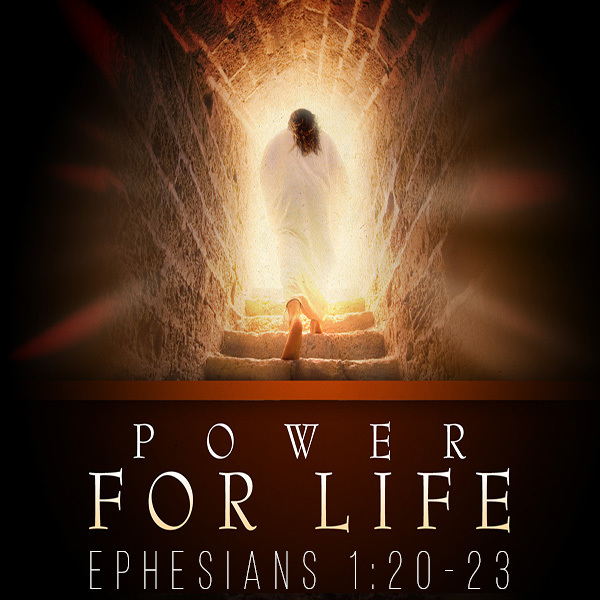 This power is available to all those who believe in Jesus for eternal life. If you have believed in Jesus for eternal life, the power that Paul is about to describe is yours. So if you want power—and I know that all of you do—listen up to see what kind of power you already have. Let’s begin with the last part of Ephesians 1:19. A slightly better translation might be “according to the working of the strength of his might.” The NIV kind of leaves you with the impression that the power that we have in Christ as believers is only like God’s power. The Greek says it is not just like God’s power, it is God’s power. And notice that Paul uses three terms for power here. The first term in the Greek is working. It is the Greek word energion. It is from this that we get the English word energy. Energion is supernatural energy. It is the powerful working of God. The second word is kratos. It means power. This word is used 12 times in the New Testament and in eleven of those it refers to power that belongs to God alone. The twelfth time, found in Hebrews 2:14 shows that Satan has a similar kind of power—but it is only the power of death. Satan gained this power by rebelling against God, but at the end of time, the power of death will be destroyed. The third word in this verse is iskus. It means might or strength. Now, why have I gone into so much detail about this power? I went into detail because Paul used three different words to describe God’s power, and whenever Scripture says something three times in a row, it is worth noting. Scripture says elsewhere that God is “Holy, Holy, Holy” (Isa 6:3; Rev 4:8), which means that He is perfectly holy. It is one of His supreme attributes. So here, when the Bible says (cf. 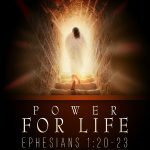 also Eph 6:10) that God is powerful, powerful, powerful, we know that He is completely powerful. It also is one of his primary characteristics. And while we will be holy when we get to heaven, Paul says here that God is sharing His amazing power with us right now. God’s power, might and strength is given to us who believe. Of course, power is a little abstract, right? It’s hard to get a grasp on how powerful God is. So Paul gives us in the next four verses some concrete examples of how great this power is. Let us begin with Ephesians 1:20. How great is this power of God? Well, first of all, God used it when He raised Jesus from the dead. Do you know any power of this world that can do that? There are many powers in the world that can take life. In fact, as I just mentioned, that is the kind of power Satan has. But God has the kind of power that gives life. The power that raised Jesus from the dead, as the verse says. But Ephesians 1:20 says even more than that. Ephesians 1:21. far above all rule and authority, power and dominion, and every title that can be given, not only in the present age but also in the one to come. Paul is coving his bases here! Jesus Christ is far above. He’s not just barely above, he is far above. There’s no contest! He is far above all rule and authority, power and dominion, and every title that can be given. In Paul’s day, these five words—rule, authority, power, dominion and title—described different levels of spiritual beings. It is kind of like a spiritual hierarchy. I’m not going to go into great detail on what these are because honestly, the Bible doesn’t tell us much. Anything I could say would be mere speculation. But the Bible does give us a few clues. The Bible hints that these spiritual beings guide and direct earthly rulers and nations (cf. Dan 4:35, 10:13). Later on in Ephesians, we learn also that it is against these beings that our true battle is. We are not in a battle against flesh and blood, but against rulers, authorities, powers and dominions. We will look at this more when we get to Ephesians 6. So while the we are not told here (or anywhere) much about these spiritual beings—we don’t have an explanation of their powers or of what kind of effects they can have on the believers—Paul’s point is that we don’t need to worry, because Christ is far above them. Now you should know that the last of these five, the phrase every title that can be given can also be translated as every name that can be named (cf. Php 2:9). Magicians in the ancient world—especially around Ephesus—believed that if they learned the name of a spiritual being, they could gain power over that being by naming its name. These magicians put much fear in the hearts of men and women. These spirits were connected with health, love, success, life and death. To ward off these evil spirits, the magicians also made a fortune off of amulets, charms, and certain religious practices. Of course, we don’t deal with that in our scientifically advanced culture, do we? How much of our society is superstitious, accepts astrology, and is fascinated with thought about spiritual beings? The “psychic network”—I’m sure you’ve seen commercials for Miss Cleo on television—is a multimillion dollar industry. Right in the middle of our “scientific” culture, major news magazines and television series focus on angels and spiritual forces. And we say, “Ah but Pastor, that’s the non-Christians.” Really? You can go to many churches that concern themselves with “binding Satan,” identifying “territorial spirits,” and wrestling with evil. Last year, I read about a bunch of churches that decided the way to defeat evil in their town was to write Bible verses on wooden stakes and then go drive them the ground in certain areas with the hopes that this would drive away any territorial sprits and reclaim the area for God. I chose to not have our church participate, because I believe Satan would rather have us fight him through such methods than actually go love and serve people in our community. Satan is not a vampire who can be driven out of town with wooden stakes. One that always makes me upset is when some pastor or leader is praying to God, and all of a sudden they start talking to Satan. “Oh God, we thank you for this day, and Oh Satan, we bind you in the name of Jesus and command you to leave this place.” Often, their prayers focus more on Satan and his demons than they do on God. Paul’s point here is that we don’t have to worry about these things. He that is in us is greater than he that is in the world. Christ is far above all rule, authority, power, dominion and title. In the rest of Ephesians 1:21, Jesus has this complete power not only in the present age, but also in the age to come. Jesus Christ is in control now, and He will always be in control. He will not be overthrown. There will not be a coup. Christ will rule forever. God’s power is so great that He raised Christ from the dead, and placed Christ in a position of authority over all things, both now and forever. Ephesians 1:22 elaborates some more. When God created the world, he gave the first man, Adam, the right to rule over everything on earth. But Adam sinned and lost that right. So now, Christ, the second Adam, has regained it by receiving power over everything. Obviously, if Christ has power over everything, He has the right to rule everything as well. So God took every created thing, and placed it under Christ. The term under his feet simply means that Christ is over all and above all. Christ has more power than everything; and He rules over everything. But some of you, if you were following along in your Bibles, noticed that I left out a phrase at the end of Ephesians 1:22. I left it out because this is where the passage really gets exciting. Why did God give all of this power to Jesus? Yes, Jesus deserved it. Yes, Jesust is God’s only Son. But Jesus was already God, and so in reality, He already had this kind of power. So why does God make a point of declaring Jesus to be the supreme ruler over the entire created universe? The reason is found in the last three words of Ephesians 1:22. God gave this power to Jesus Christ for the church! Some of your translations might say to the church. It is the same idea. The power that raised Christ from the dead, that seated Christ at the right hand of God, that gave Christ supremacy over all rulers and authorities, over all powers and dominions, over ever title that can be given throughout all eternity, that placed all things under Christ and that appointed Christ as the head over everything,…this power, is for the church. This power is given to the church! This shouldn’t be a surprise to us. What has Paul been saying over and over and over? What is Paul’s favorite term in Ephesians? In Christ. As Christians, we are IN CHRIST! What Christ has, we have. If Christ is given this amazing power, so are we. How can this be, you ask? Ephesians 1:23 tells us. Ephesians 1:23. which is his body, the fullness of him who fills everything in every way. The church has what Christ has because we are his body. Paul develops this idea much more in 1 Corinthians 12, but the idea is really quite simple. Being the body of Christ is a symbol of how we are all to work together for a common purpose, as we follow the directions that come from the head. Christ is the head of the church, and we are the body of the church. A body that is separated from the head is a lifeless body. In the same way, whatever the head owns, the body also owns. So if Christ, the head of the church, has ultimate power, so does the body of church. If Christ has this power, so do we. And together, as a unified church, as a body of believers under the direction of Christ the head, Paul says we are the fullness of him who fills everything in every way or the fullness of him who fills all in all. The idea here is not that we complete or fulfill Christ. He doesn’t need us to complete him. Rather, Christ, as the Head of the church, fills the church with blessings. In Christ dwells the fullness, and from His fullness, He fills us to overflowing. We just need to use what He has given to us. Did the light just come on for some of you? Me bumbling around up here with the overhead was intentional. It was picture of how most of live as Christians. We have heard that the Christian life is full of joy. We have heard that there is nothing greater. We have heard that it provides what this world cannot. That it meets our needs. But most of us never get plugged into the power, and when the Christian life doesn’t seem to work, we feel like somebody lied to us. You weren’t lied to. You just haven’t been using the power. So if you get fed up with the Christian life sometimes, it might be due to the fact that you’re not plugged in. How do you know if you’re plugged in or not? Well, how do we know if this overhead is plugged in or not? We know the overhead is plugged in because it works. You can know you are plugged in to the power of God when you work. In other words, you can know you are using the power of God when you are actually doing something for God, and when there is joy and fulfillment in doing it. Only when both of these are happening, can you know that you are functioning as part of the body of Christ. It has been said that there is enough spiritual power going to waste to put Niagara Falls to shame. Some of us, when we hear all this talk of power, begin imagining miraculous signs and wonders, and we begin to think that we will know we have power when we go and start healing people at the hospital. But that is not Paul’s point. The idea here is exactly what Paul says in Romans 8:31-39: God’s power does not remove us from persecution, danger, difficulty, sickness and death, but makes us more than conquerors in and through all such things. This is not a power to work magic and escape the difficulties of this world, but a power to live in an evil world. To be in the world, but not of it. This power we have in Christ is for godly living. It is the power to love when we would rather hate, to forgive when we would rather fight, and to serve when we would rather punish. The power of God in us gives us the ability to live and love like Jesus Christ in this world, and you can know that His power is coursing through you if your life is looking more and more like Jesus every day. This doesn’t mean lots of Bible study and prayer. Such things are helpful, but such things are only some of the instruments through which the power of God in us works and functions. The true power only works when we are plugged in, the light is on, and the love is flowing through us to the world. Just before World War II, a school in Itasca, Texas caught fire and killed 263 children who couldn’t escape. Afterwards, the town decided to never let such a disaster occur again. So when they built the new school, they installed the best sprinkler system that money could buy. Reassured, parents again began to send their children to the school. Within seven years though, the town had grown and the school needed to be enlarged. As workmen began construction, they discovered an appalling fact. The best sprinkler system their money could buy had never been connected to the water line. The story makes us shudder, but the sad reality is that many Christians live their lives in exactly the same way. Just like that sprinkling system, just like this overhead, many Christians are not plugged in. Get plugged in to the power, and let God’s love flow through you to a waiting and watching world. This is very powerful.May the Lord bless you more Servant of the Most High. I had been reading this passage and wondered what is the power that is mentioned. thank you for clarifying to me what it means. I do want to share the gospel with others. why was the power of death given to the devil. Was it only to demonstrate the power of God, by destroying it at the resurrection of Jesus? I certainly enjoyed being enlightened by the thoughts that you expanded on and I am ready to draw from that inexhaustable power available to me.